The Optimist is a small, single-handed sailing dinghy intended for use by children up to the age of 15. Nowadays boats are usually made of fibreglass, although wooden boats are still built. The Optimist is recognised as an International Class by the International Sailing Federation. The Optimist was designed in 1947 by American Clark Mills at the request of the Clearwater Florida Optimist service club following a proposal by Major Clifford McKay to offer low-cost sailing for young people. He designed a simple pram that could be built from three sheets of plywood, and donated the plan to the Optimists. The design was slightly modified and introduced to Europe by the Dane, Axel Damgaard, and spread outwards across Europe from Scandinavia. The design was standardized in 1960 and became a strict One-Design in 1995. The Optimist is sailed in over 120 countries and it is one of only two yachts approved by the International Sailing Federationexclusively for sailors under 16. The single sail of the Optimist is sprit-rigged. Two battens stiffen the leech. It is secured evenly with ties along the luff to the mastand along the foot to the boom, pulled down tightly by a vang/kicker. The light, slim third spar, the sprit, extends through a loop at the peak of the sail; the bottom rests in the eye of a short cable or string which hangs along the front edge of the mast. Raising and lowering the sprit and adjusting the boom vang allow for adaptation of sail trim to a range of wind conditions. Similarly, the Optimist has a small string outhaul on the end of the boom. It is usually correct to tighten the boomvang, outhaul, and sprit in heavy winds and loosen them in light winds. As well as this, huge adjustments can be made to sail shape, due to all of the ties running along the mast and boom. The spars may be made from aluminium or wood, but are invariably aluminium in modern boats. A monograph-style “IO” insignia (after IODA – the International Optimist Dinghy Association) on the sail is a registered trade-mark and may only be used under licence from the International Optimist Association. Optimists also have a national sail number using the Olympic abbreviation of their country and a sequential numbers. e.g. GBR for Great Britain. The Optimist has a pram hull, originally formed primarily from five pieces of plywood. It was the biggest hull Clark Mills could make from two 4 ft by 8 ft sheets. Just in front of a bulkhead, which partitions the boat nearly in half, is the daggerboard case. Right behind it on the centerline of the hull floor are attached a pulley and ratchet block. These anchor the sheet and its pulley on the boom directly above. At the bow resides a thwart to support the mast which passes through a hole in its centre to the mast step mounted on the centre line of the boat. The painter, a rope used for securing a boat like a mooring line, is usually tied around the mast step. Buoyancy bags are installed inboard along each side in the front half of the boat and at the stern to add buoyancy in the event of capsizing. Two straps, known as “hiking straps”, run lengthwise along the floor from bulkhead to stern. These and a tiller extension allow a sailor to hang off the side for weight distribution—commonly called “hiking out”. This can be crucial to maintaining the boat in near horizontal disposition during heavy air, allowing greater speed through the water and more manoeuvrability. The vast majority of hulls today are made of Fiberglass, although it is still possible to make and buy wooden hulls. The rudder and daggerboard may be made from plywood or a composite of foam, glass fibre, and epoxy. 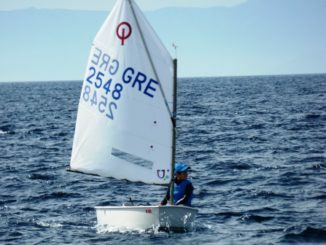 While younger lighter sailors begin in Optimists, competitive sailors usually weigh between 35 and 55 kg (or between 80 lbs. and 125 lbs. ).Optimists can be sailed by children from age 8 to 15. 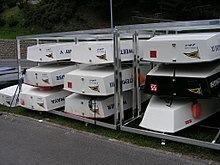 This wide range of weights which is not typical of most dinghies is made possible by different cuts of sail. Due to its inherent stability, unstayed rig, robust construction and relatively small sail, the Optimist can be sailed in winds of up to 30 knots. The Optimist is the slowest dinghy in the world according to the RYA Portsmouth Yardstick scheme, with a Portsmouth number of 1646. Its equivalent rating in the US scheme is a D-PN of 123.6. Optimists are used for beginners. Light weight sailors continue to race them up 14 to 15 years of age. The age limit is 15. Very small children are sometimes “doubled up” but usually the boats are single-handers. 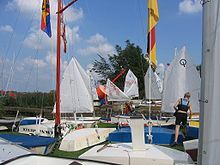 Many sailing schools and yacht clubs own a number of them and they are the first boat most beginners will sail. The Optimist is the biggest youth racing class in the world. 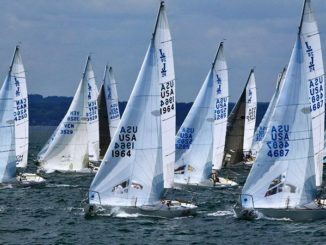 As well as the annual world championship the class also has six continental championships, attended by a total of over 850 sailors a year. 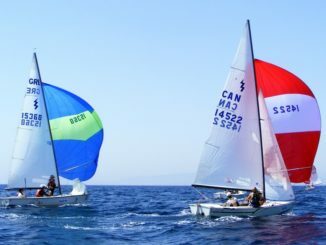 Many of the top world Optimist sailors have become world-class Laser Radial or 4.7 sailors after they “age-out” but many also excel in double-handers such as the 420 and 29er. At the 2016 Olympics at least 85% of the boat skippers were former Optimist sailors. Optimists are manufactured to the same specification by many builders. The overall quality of the hulls is varied. Numerous sails and spars allow sailors to customize their boats. The total cost has increased due to these expensive sails and spars. The first World Championships were held in Great Britain in 1962, and they have since been arranged annually. For the first 20 years, the class was dominated by sailors from the Scandinavian countries, with 13 world champions. In the 1990s Argentina was by far the dominant country but since the turn of the millennium there has been no single dominant country, with the 33 medallists coming from 20 countries on five continents. Currently the USA and Singapore are the best teams in the world. This is decided at Optimist World Championships for team racing and individual racing. Other championships are held continentally, such as the European Championships, Asian, North American and South American. NAAIX ( Barcelona, Spain ) Náutica Aixemeno.